This article is the third out of an unlimited series (let’s say at least 5!) where I’m gonna try to give you some ideas and easy things to put in place in order to bring your team closer to business people so that you can work collaboratively and efficiently with them. In the previous post you read how Impact Mapping gives you the goal to reach and what are your options to do so, now it’s time to get more into how the system works. An Event Storming session will involve almost the same people as for an Impact Mapping’s one but the aim is quite different! 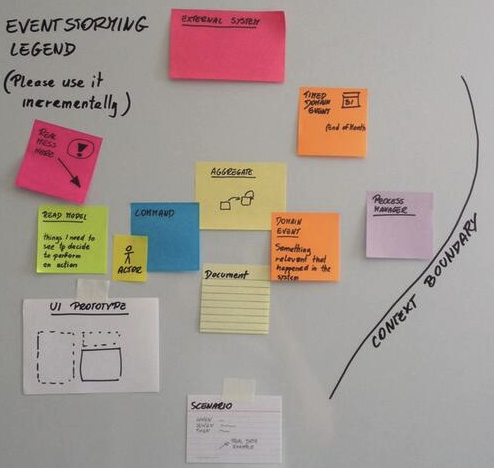 Event Storming is about to find out all the events that occur in the system -> the business processes. Domain experts, the business people, know the system by heart and their job here will be to answer to a lot of questions! Those questions will be asked by a mix of different people (including developers, team leaders, testers, …), bring the curious ones! After an ES session, everyone should be able to share the same vision on how the system behaves and the icing on the cake: everyone should share the same language to describe this (see the Ubiquitous Language). First of all, you’ll need to find a big wall that you’ll cover with plotter paper or electrostatic sheets in order to be able to put sticky notes and maybe draw some lines and write text. Get some markers and different colors sticky notes. Decide to focus on a particular part of the domain (unless this could last more than a day!) and start by asking this simple question to your domain experts: “What’s the most important event that should occur in the system?”. If you’re working for a company that sells things on the Internet, and that you’re focusing on the ordering process, the answer should sound like “Cart checked out” or something similar. Now that you have that specific event, act as a time machine and try to find out together with the domain experts, what happened before this one. Write every single event on sticky note and put them in the right order. Look what we have here? The method names of the not yet written application code! How could you be more close to business people if even your code speaks business? ;-) That’s the point where your code really brings business value! I must admit this is a too simplistic example but you get the point, right? At the end of an ES session every people involved knows exactly how the system works and behaves, what are the events that should occur and their corresponding command (and actor). You should be able to point out potential conflicts or missing concepts but new opportunities as well! Last but not least, everyone shares the same language and did speak together! Bonus: If you’re into DDD, Event Storming can even bring more than that as you’ll be able to find out the Bounded Context and Aggregate Roots of your system.